This article is about the English rock musician. For the British ice hockey player, see Ronnie Wood (ice hockey). For the Australian footballer, see Ron Wood (footballer). For the baseball player, see Ron Woods. Ronald David Wood (born 1 June 1947) is an English rock musician, songwriter, multi-instrumentalist, artist, author and radio personality best known as a member of The Rolling Stones since 1975, as well as a member of Faces and the Jeff Beck Group. Wood began his career in 1964, when he joined The Birds on guitar. He then joined the mod group The Creation, but remained with the group only for a short time and appeared on a small number of singles. Wood joined the Jeff Beck Group in 1967 as a bass player. The band released two albums, Truth and Beck-Ola, which became moderate successes. The group split in 1969, and Wood departed along with lead vocalist Rod Stewart to join former Small Faces members Ronnie Lane, Ian McLagan and Kenney Jones in a new group named Faces. The group found great success in the UK and mainland Europe, though were relegated to cult status in the United States. Faces released its debut album, First Step, in 1970. The group went on to release Long Player and A Nod Is As Good As a Wink... to a Blind Horse in 1971. Their last LP, titled Ooh La La, was released in 1973. As the group began to split, Wood started several solo projects, eventually recording his first solo LP, I've Got My Own Album to Do, in 1974. The album featured bandmate McLagan as well as former Beatle George Harrison and Keith Richards of The Rolling Stones, a longtime friend of Wood's. Richards soon invited Wood to join the Rolling Stones, after the departure of Mick Taylor. Wood joined in 1975 and has remained a member ever since. Besides I've Got My Own Album to Do, Wood has recorded several other solo efforts. Now Look was released in 1975, and peaked at NO. 118 on Billboard, and Wood collaborated with Ronnie Lane for the soundtrack album Mahoney's Last Stand. He released Gimme Some Neck in 1979, which hit No. 45 in the US, 1234 was released in 1981, peaking at No. 164. He released Slide on This in 1992, Not for Beginners came out in 2002. and I Feel Like Playing in 2010. As a member of the Rolling Stones, Wood was inducted into the Rock and Roll Hall of Fame in 1989, and was inducted a second time, as a member of Faces, in April 2012. Wood began his career as a professional musician in 1964 as a guitarist with the Birds, a R&B band based in Yiewsley, Middlesex. A popular live act with a considerable fan base, the Birds released several singles in the mid-1960s; Wood wrote or co-wrote nearly half the songs the group recorded. By 1967 the Birds had disbanded, and Wood briefly took part in a project called Santa Barbara Machine Head before joining the Jeff Beck Group as a bassist. Along with vocalist Rod Stewart, Wood did several tours with Beck and recorded two albums: Truth in 1968 and Beck-Ola in 1969. In between Jeff Beck Group projects, Wood also worked with the Creation. In 1969, after Steve Marriott left the Small Faces, Wood began working with the remaining members of that group, returning to his instrument of choice, the guitar. This line-up, plus Rod Stewart and former Bird Kim Gardner, teamed up with Wood's brother Art Wood in a formation called Quiet Melon, making a handful of recordings in May 1969. 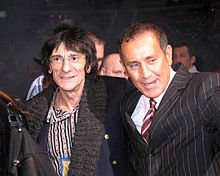 After the Jeff Beck Group's fifth US tour in July, Wood and Stewart joined the former Small Faces full-time, and the band's name was changed to Faces. During the summer of 1969, Stewart and Wood also set the template for what would become The Faces on An Old Raincoat Won't Ever Let You Down, Stewart's first solo album (known as The Rod Stewart Album in the US). The backing band on the album also included Ian McLagan, Keith Emerson, Micky Waller and guitarists Martin Pugh (of Steamhammer and later Armageddon and 7th Order), and Martin Quittenton (also from Steamhammer). In the first half of the 1970s, Faces released four studio albums and were among the top-grossing live acts of the period. Besides his distinctive guitar work, Wood contributed harmonica, vocals and bass to the band's recordings, and co-wrote many of their songs, including "Stay With Me" and "Ooh La La". He also played on bandmate Stewart's first few solo albums, and is co-writer of the Rod Stewart songs "Gasoline Alley" and "Every Picture Tells a Story", as well as several songs on Never a Dull Moment. In 1972, Wood and Faces bassist Ronnie Lane composed the soundtrack to the film Mahoney's Last Stand; the soundtrack, which was released as an LP in 1976, also features Faces bandmates Ian McLagan and Kenney Jones, along with contributions from Pete Townshend and Ric Grech. Wood also performed with Townshend, Grech, Steve Winwood, Jim Capaldi and Eric Clapton at Clapton's Rainbow Concert in 1973. In 1973 Wood asked his old friend Mick Taylor, who he had known since the early 60s, to help out with his first solo album. In December 1973, Wood collaborated with Mick Jagger on the song "It's Only Rock'n Roll (But I Like It)". Eventually, Jagger and Keith Richards also contributed to Wood's solo LP. I've Got My Own Album to Do, was released in 1974 and recorded at Wood's private studio in the basement of his home in London, The Wick. Following Mick Taylor's departure from the Rolling Stones in December 1974, Wood participated in the band's March 1975 recording sessions for its forthcoming album Black and Blue. Although still a member of the Faces, he toured North America with the Rolling Stones in 1975; the Faces announced its break-up in December of that year, and Wood was officially declared a member of the Rolling Stones in February 1976. In the Rolling Stones, Wood plays the slide guitar as Taylor and Brian Jones had done before him, adding both lap steel and pedal steel guitar. In addition, Wood, as did his predecessors, exchanges roles on the guitar with Richards, often blurring the boundaries between rhythm and lead, even within a particular song. He also occasionally plays bass guitar, as seen during 1975 concert performances of "Fingerprint File", when Mick Jagger played rhythm guitar and bassist Bill Wyman moved to synthesizer. The Rolling Stones single "Emotional Rescue" also features Wood on bass. He has been given credit as a co-writer for a dozen songs, including "Dance", "Black Limousine", "One Hit (to the Body)" and "Had It With You". In 1975, Wood released his second solo album, Now Look; his third, Gimme Some Neck, came out in 1979. To promote it, Wood formed and toured with the New Barbarians, playing 20 concerts in Canada and the US in April/May and the Knebworth Festival in the UK in August. Throughout the 1980s, Wood played as an official member of the Rolling Stones; continued his solo career, releasing the album 1234 in 1981; painted; and collaborated with a number of other artists, including Prince, Bob Dylan, David Bowie, Eric Clapton, Bo Diddley, Ringo Starr and Aretha Franklin. At the 1985 Live Aid Concert in Philadelphia, Wood along with Keith Richards performed in the penultimate set with Bob Dylan. During the performance of "Blowin' in the Wind", one of Dylan's guitar strings broke. Wood gave Dylan his guitar to keep the performance seamless and played air guitar until a stagehand brought him a replacement. In 1990 Wood was made a fully fledged partner in the Rolling Stones' financial organisation. During the 1990s the Rolling Stones released two studio albums and three concert albums, as well as touring in 1990, 1994–95 and 1997–99. In addition, Wood released his seventh solo album, Slide on This, in 1992; he toured to promote this album in North America and Japan. His appearance in 1993 with former bandmate Rod Stewart on MTV Unplugged resulted in a hit album titled Unplugged...and Seated; the concert album that Wood released in 1993 from his own tour was called Slide on Live: Plugged in and Standing. Wood also contributed to Bo Diddley's 1996 album, A Man Amongst Men, playing slide guitar on the tracks "Hey Baby," "A Man Amongst Men" and "Oops! Bo Diddley" and guitar on "I Can't Stand It". Since 2000 Wood has continued to combine solo work with his Rolling Stones schedule. After the 2001 release of his album Not For Beginners, Wood toured England and Ireland in 2001 and 2002 with his own group, the Ronnie Wood Band. The band included members of his family, Slash and Andrea Corr. After the tour a DVD called Far East Man was released. Wood toured with the Rolling Stones in 2002 and 2003; in 2004 he performed several one-off concerts and guest appearances, including a number of appearances with Rod Stewart. Later in the year the two expressed intentions of finishing the studio work on a collaborative album to be titled You Strum and I'll Sing. In 2005, however, Wood was again busy with the Rolling Stones as the band recorded its A Bigger Bang album. Although playing on only 10 of the album's 16 tracks, Wood embarked on the tour which ran through until August 2007. In 2005 Wood launched his own record company, Wooden Records, which has released recordings by his daughter Leah, the New Barbarians and others. In November 2006, during a break in the Rolling Stones' A Bigger Bang tour, Wood played guitar on three tracks for British soul artist Beverley Knight's album Music City Soul, released in 2007. On 9 May 2009, Wood along with Red Hot Chili Peppers members Anthony Kiedis, Michael "Flea" Balzary, Chad Smith and musician Ivan Neville performed under the name, "the Insects" at the fifth annual MusiCares event honouring Kiedis. On 11 August 2009 Wood joined Pearl Jam on the stage of Shepherd's Bush Empire in London for a performance of "All Along the Watchtower". On 25 October 2009, Wood, Ian McLagan and Kenney Jones joined forces for a Faces performance at London's Royal Albert Hall on behalf of the Performing Rights Society's Music Members' Benevolent Fund. Bill Wyman played bass and lead vocals were shared by several performers, notably Mick Hucknall. Rod Stewart, who had earlier denied rumours of plans for a Faces reunion in 2009, was not present. On 2 November 2009 Wood was given an "Outstanding Contribution" award at the Classic Rock Roll of Honour ceremony in London. Pete Townshend presented the award. Since 9 April 2010, Wood has presented his own radio show on Absolute Radio. Airing on Saturday night at 10 p.m., the one-hour show consists of Wood playing tracks by artists he has worked with and other personal favourites. In May 2011 Wood won the Sony Radio Personality of the Year award for The Ronnie Wood Show. Wood with promoter Joseph Donofrio, 2006. Both of his older brothers, Art and Ted, were graphic artists as well as musicians. Ted Wood died in 2004, and Art Wood in 2006. Wood has six children. Jesse is his son with his first wife, Krissy (née Findlay), a former model to whom he was married from 1971 to 1978. During this time he had an affair with George Harrison's former wife, Pattie Boyd. Findlay died in 2005. In 1985 Wood married his second wife, Jo Wood (née Karslake), mother of his daughter Leah and son Tyrone. He also adopted Jo Wood's son, Jamie, from a previous relationship. In addition to his six children, Wood has 6 grandchildren. Wood has been frank about his struggle with alcoholism; although reports between 2003 and 2006 had indicated that he had been sober since the Rolling Stones' 2002–03 tour, in June 2006 it was reported that Wood was entering rehab following a spell of increased alcohol abuse. By July 2008, ITN reported that Wood had checked himself into rehab a total of six times, the last time being before the wedding of his daughter, Leah. He had plans once again for a seventh admission. Wood also took up stamp collecting as part of his alcoholism rehab. In July 2008 he left his wife for Katia Ivanova (variously reported to be between 18 and 21 years old at the time), whom he had met in a London club. Wood checked into rehab again on 16 July 2008. Jo Wood filed for divorce, which was granted in 2009. On 3 December 2009, Wood was arrested over assault "in connection with a domestic incident." He was cautioned for this offence on 22 December 2009. On 21 December 2012, Wood married Sally Humphreys, the owner of a theatre production company, 31 years his junior. Their twin girls, named Gracie Jane and Alice Rose, were born on Monday 30 May 2016, just before Ronnie Wood's 69th birthday on 1 June 2016. In 2017 Wood was diagnosed with lung cancer necessitating the partial removal of his lung. Wood refused chemotherapy because he did not want to lose his hair. Ronnie Wood has a long standing interest in Thoroughbred breeding and racing. One of his best known horses is Sandymount Duke, bred by Wood, who has competed in both flat and jumps racing under trainer Jessica Harrington. . In January 2019, it was announced that Sandymount Duke was being aimed at the Grand National at Aintree racecourse. Wood at his art exhibition in Hotell Cramer Malmö 1988. Wood is a well known visual artist. When he was a child his drawings were featured on the BBC television programme Sketch Club; he won one of that programme's competitions, an achievement he refers to as his "awakening to art." He went on to train at the Ealing Art College, as both his brothers had. Other notable musicians, Freddie Mercury of Queen and Pete Townshend of the Who, also attended in the 1960s. Wood's paintings, drawings and prints frequently feature icons of popular culture and have been exhibited all over the world. He did the cover artwork to Eric Clapton's 1988 box set Crossroads. Several of his paintings, including a work commissioned by Andrew Lloyd Webber, are displayed at London's Drury Lane Theatre. Art critic Brian Sewell has called Wood "an accomplished and respectable artist"; and the South Bank Show has devoted an entire program to his artwork. Wood has maintained a long-standing relationship with the San Francisco Art Exchange, which first exhibited his work in 1987. Wood is also the co-owner (along with sons Jamie and Tyrone) of a London art gallery called Scream. To date, Wood has three books to his credit: a short collection of autobiographical anecdotes titled The Works, illustrated with Wood's artwork, co-authored by Bill German and published in 1988; a limited-edition art book titled Wood on Canvas: Every Picture Tells a Story, published in 1998 by Genesis Publications; and his 2007 autobiography Ronnie, written in collaboration with his son-in-law Jack MacDonald and Jeffrey Robinson. In addition to numerous Faces and Rolling Stones concert films, broadcasts and documentaries, Wood performed alongside the Band, Bob Dylan and many others in the finale of the documentary The Last Waltz, filmed in 1976. He has made cameo appearances in feature films, including The Deadly Bees (1967), The Wild Life (1984) and 9½ Weeks (1986), as well as on television programs including The Rutles: All You Need Is Cash (1978). In October 2007 Wood appeared on the television motor show Top Gear, achieving a celebrity lap time of 1:49.4. ^ a b c Prato, Greg. "Ron Wood". Retrieved 22 December 2009. ^ Wells, David (March 2007). "Bird Song". Record Collector. pp. 60–66. ^ "liner notes to The Collector's Guide to Rare British Birds". Deram Records. June 2005. ^ a b c d e Zentgraf, Nico. "Woodworks 1957–1975". Archived from the original on 19 March 2008. Retrieved 23 February 2008. ^ McLagan, Ian (2000). All the Rage (revised edition). Pan Books. pp. 151–153. ISBN 0-330-37673-X. ^ "Rod Stewart Album by Umvd Special Markets, Rod Stewart | 731455805826 | CD | Barnes & Noble". Barnesandnoble.com. 31 March 1998. Archived from the original on 10 November 2014. Retrieved 28 February 2015. ^ Wall, Mick (May 2007). "A Walk Through the Wood". Classic Rock. Future Publishing Ltd. pp. 58–63. ^ a b c d e Zentgraf, Nico. "The Complete Works of the Rolling Stones 1962–2008". Archived from the original on 19 March 2008. Retrieved 23 February 2008. ^ Wood, Ronnie (2007). Ronnie. Macmillan. pp. 110–112, pg. 115–116. ISBN 978-0-230-70131-1. ^ Wood 2007. pg. 137. ^ Jagger, Richards, Watts & Wood 2003. pg. 180. ^ Wood 2007. pg. 187–192. ^ McLagan 2000. pg. 294–300. ^ Wood 2007. pg. 251. ^ Jagger, Richards, Watts & Wood 2003. pg. 257. ^ "Anthony Kiedis And Flea Discuss The Insects With Ronnie Wood And Ivan Neville". Ultimate-guitar.com. Archived from the original on 4 May 2010. Retrieved 29 April 2010. ^ "Ronnie Wood with Pearl Jam Shepherd's Bush YouTube video". Archived from the original on 1 February 2014. ^ Fortnam, Ian (26 October 2009). "Holding Back The Jeers: Hucknall Sings With Faces". Classic Rock. Archived from the original on 31 October 2009. Retrieved 31 October 2009. ^ "Rod Stewart denies Faces reunion". Newsvote.bbc.co.uk. 23 January 2009. Retrieved 29 April 2010. ^ Masters, Tim (3 November 2009). "Rolling Stone Wood wins rock gong". BBC News. Archived from the original on 4 November 2009. Retrieved 4 November 2009. ^ "Gallery: Britain Rock Awards". Herald-Dispatch. 2 November 2009. Archived from the original on 25 January 2013. Retrieved 3 November 2009. ^ "Absolute Radio, Weekly schedule – The Ronnie Wood Show". Absoluteradio.co.uk. Archived from the original on 3 April 2008. Retrieved 10 December 2011. ^ "Ronnie Wood wins Sony music radio personality award". BBC News. 10 May 2011. Archived from the original on 19 May 2011. Retrieved 17 May 2011. ^ Wood 2007. pg. 3. ^ "West Bromwich Albion's famous supporters". Birmingham mail. 23 June 2015. Retrieved 27 December 2017. ^ Perrone, Pierre (6 November 2006). "Obituary: Art Wood: Frontman of the Artwoods". London: The Independent. Archived from the original on 3 April 2008. Retrieved 22 February 2008. ^ Cadwalladr, Carole (25 August 2007). "Wood and it be good". The Guardian. UK. Archived from the original on 8 December 2015. Retrieved 7 December 2015. ^ McFadyean, Melanie (23 October 2011). "How We Met: 49. Ronnie and Jo Wood". Archived from the original on 8 December 2015. Retrieved 7 December 2015. ^ Bonnici, Tony. "Ronnie Wood to become a father aged 69". Thetimes.co.uk. Retrieved 26 May 2018. ^ DPA (14 June 2006). "After the tree... it's rehab". The Sydney Morning Herald. Archived from the original on 14 June 2007. Retrieved 17 May 2007. ^ Entertainment from ITN (17 July 2008). "Ronnie Wood checks into rehab". ITN news agency. Archived from the original on 3 April 2008. Retrieved 16 December 2009. 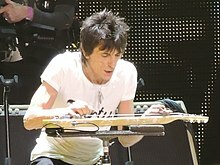 ^ "Guitarist Ron Wood Collects Stamps". Linn's Stamp News: 15. 30 January 2006. ^ "Fox News". Fox News. 11 July 2008. Archived from the original on 3 April 2008. Retrieved 29 April 2010. ^ Brown, Jonathan (17 July 2008). "Ronnie Wood enters rehab for a seventh time". The Independent Music. London: independent.co.uk. Archived from the original on 27 October 2009. Retrieved 23 July 2009. ^ "Ronnie Wood is admitted to rehab". BBC News. 17 July 2008. Archived from the original on 8 August 2017. Retrieved 10 April 2010. ^ "Jo Wood, former wife of Rolling Stones frontman Ronnie, admits she was an 'out-of-control' mother". The Daily Telegraph. 1 March 2013. Archived from the original on 8 February 2015. Retrieved 8 February 2015. ^ "BBC News – Ronnie Wood arrested over assault". news.bbc.co.uk. 3 December 2009. Archived from the original on 18 August 2017. Retrieved 3 December 2009. ^ "BBC News – Rolling Stone Ronnie Wood cautioned for assault". news.bbc.co.uk. 22 December 2009. Archived from the original on 3 April 2008. Retrieved 22 December 2009. ^ Blas, Lorena (22 December 2012). "Rolling Stones' Ronnie Wood marries". USA Today. Archived from the original on 3 April 2008. Retrieved 22 December 2012. ^ "Rolling Stones Guitarist Ronnie Wood Weds 34-Year-Old, Wears Pink Socks". Pop Blend. Archived from the original on 3 April 2008. Retrieved 22 December 2012. ^ "Rolling Stone's Ronnie Wood becomes dad to twins -- at 68". CNN. 31 May 2016. Archived from the original on 7 August 2016. Retrieved 1 June 2016. ^ a b "Ronnie Wood had part of lung removed after cancer diagnosis...but refused chemo to keep hair". The Telegraph. 6 August 2017. Archived from the original on 6 August 2017. Retrieved 6 August 2017. ^ "My horse Sandymount Duke just won at Listowel 40-1 !!". Ronnie Wood. 17 September 2014. Retrieved 5 December 2018. ^ "Horse Profile - Sandymount Duke (IRE)". Sky Sports. 2 August 2017. Retrieved 5 December 2018. ^ "Grand National 2019: Ronnie Wood, Sir Alex Ferguson enter horses in race". BBC Sport. 30 January 2019. ^ "Ronnie Wood and stars aiming for Aintree glory". The Jockey Club. 30 January 2019. ^ Wood 2007. pg. 18–19. ^ Wood 2007. pg. 319–324. ^ "The Big Bang". The Big Issue. The Big Issue Company Ltd. 20–26 August 2007. p. 9. ^ "The South Bank Show". The South Bank Show. Season 28. Episode 626. 5 September 2004. Archived from the original on 8 April 2016. ^ "San Francisco Art Exchange". Sfae.com. Archived from the original on 25 December 2011. Retrieved 10 December 2011. ^ Wood 2007. pg. 325. ^ The Band, Bob Dylan, Ronnie Wood et al. (1978). The Last Waltz (DVD released 2002). MGM Entertainment. ^ Wood 2007. pg. 180. ^ "Ron Wood (I)". Internet Movie Database. Archived from the original on 3 April 2008. Retrieved 22 February 2008. ^ "Celebrity Lap Times". Top Gear on BBC 2. Archived from the original on 9 April 2008. Retrieved 22 February 2008. 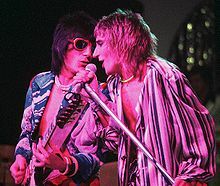 Wikimedia Commons has media related to Ron Wood. Ronnie Wood YouTube – Wood's official YouTube channel, where he interviews Rock'N'Roll personalities and occasionally presents video clips of his on-stage performances.